Every website and blog owner knows how important it is for them, to maintain the bounce. The more your information is convincible, the less you will face bounce rate. For the beginners who don’t know what is it and how to reduce it, the article is must read. Bounce rate represents the percentage rate of visitors who visit your site and leave it before navigating to other pages. That means these visitors will close the website just by going through one page of a site. In Google Analytics, you can find the bounce rate represented in the percentage, which is used to carry out the website traffic analysis. So, from this information, you might have understood that a high percentage of bounce rate on your website is not beneficial for you. This represents that the visitors are not happy with the site. It is not a favorable case for your business. Your website is a face and first mode of contact between you and your clients. The website or blog should be pleasing to attract customers rather than forcing them to leave without taking their first experience itself. How to find the Bounce rate in Google Analytics? To view the bounce rate in Google Analytics platform, carry out the following steps. Step 1: Sign-up for the Google Analytics and select the website for which you want to see and analyze the bounce rate. Step 2: Go to the Audience Overview page, to see the bounce rate of the entire website. 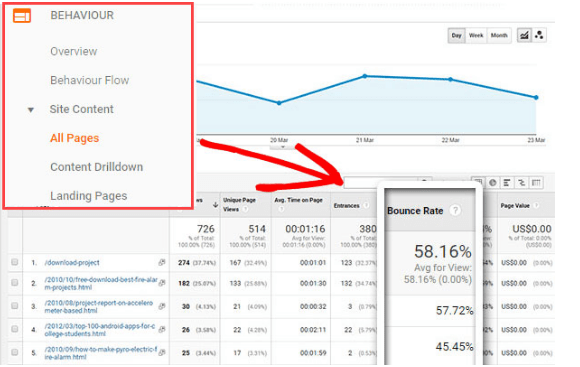 Step 3: Click on the metric Bounce Rate, which will be seen with other metrics like Pageviews, Unique Pageviews, etc. Step 4: To view the bounce rate of different pages, go to Behavior -> All Pages. Step 5: You can also see the bounce rate as per the different time period by selecting the time period. How to decide if the bounce rate on your website is moderate or not? Is your website performing excellently? Or does it fall under the 41% to a higher percent of bounce rate range? 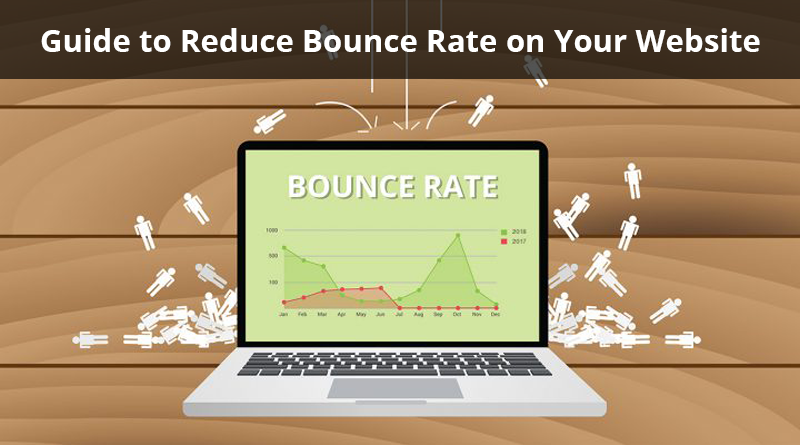 Let us see how you can reduce the bounce rate of your website. The first reason that your visitors don’t sustain on your website is poor content delivery. The format that you have used might not be a readable one. Especially, the large paragraphs of texts on your website will scare your readers, so, it is better to avoid them. 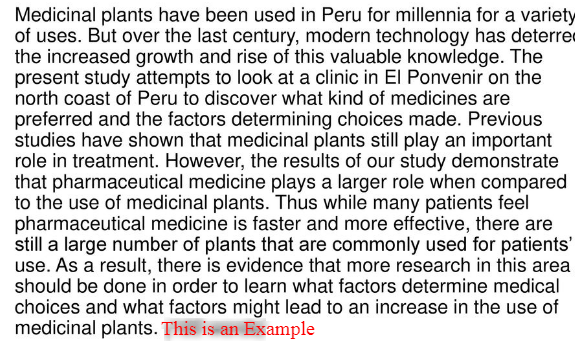 We can see in the above example, that the text used is readable, but the formatting and font are not pleasant. Having a good format alone, won’t help your website. It should also guide the visitors properly. The navigation of a website through links, buttons, and other engaging elements should be directed properly. The second form of a button, indicates clearly that it is a clickable link. Internal linking helps to reduce bounce rate and is also a great SEO strategy. But as said, the excess of anything is harmful. So, instead of linking every other word on your web page, or linking every other sentence, you should link only the helpful information suitable for the readers. Before linking anything, make sure that clicking on that should take the reader to something helpful. Because too much of hyperlinks can be more annoying for the readers. The better use of internal linking can be done in the header and footer section of a website. It will help readers to land on their desired page. You might have heard of a “fat footer” that includes the organized links. This is the appropriate way to design the web page footer. Recently, I have come across a good example of such footer on Rankraft website, so thought of sharing it with you. Pop-ups are useful if displayed once or twice during the visitors’ complete session on your site. Most of the people claim that the irrelevant pop-ups disrupt their reading, and they are forced to leave the site there only. 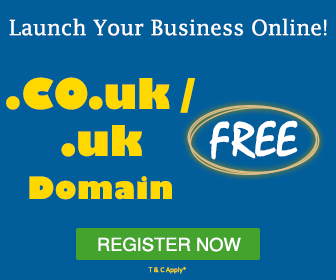 Some site owners use pop-ups very aggressively, that those keep on appearing at every second on their website. This only makes the departure of your visitors. Sometimes, pop-ups can be helpful, but only if used for a proper purpose. 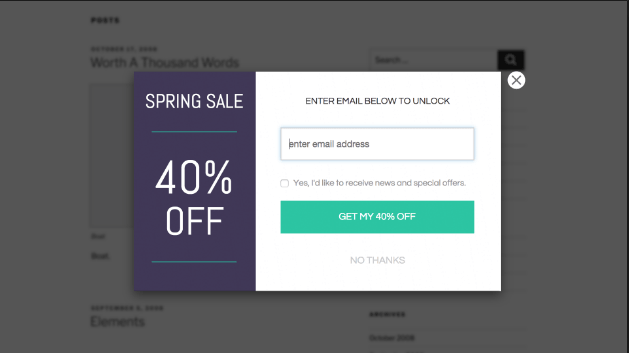 You can have one pop-up for your newsletter. This generates the interaction mode between the visitor and your site. These kinds of one or two relevant pop-ups are helpful to both. The above form of the pop-up is an annoying one, which gives bad user experience to your visitors. 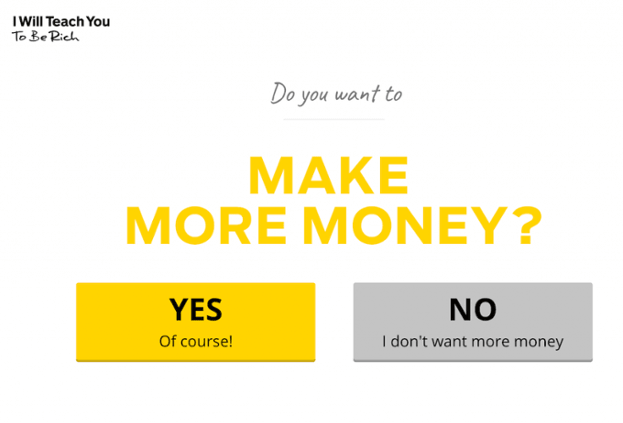 Don’t you think the above pop-up is more relevant to your business? It also looks good for the website. 4) Create Call to Action. Avoid using the same call to action every time to all the pages. Try different formats and different messages to all. 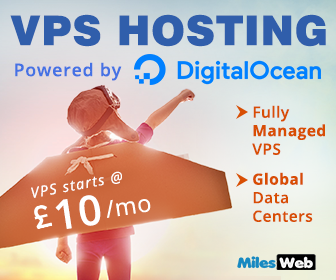 For e.g: You can put the ‘sign up for newsletter’ or ‘30% discount on web host’ kind of call to actions on your site. Such types of CTAs have heavy chances of getting conversions. 5) Improve the website brand by opting the following techniques. Your website should get fully loaded on mobile in about 22 seconds. Mobile phone users leave the website if it takes more than 3 seconds to load a web page. For that, you can reduce the size of the images, eliminate unnecessary use of scripts and also, deactivate the less useful plugins. The well-educating videos and podcast can engage your visitors for a longer time. Analyze your audience behavior through the A/B testing. It helps you to serve them the content and information for which they are actually looking. Till now, you might have understood why the bounce rate of your website increases and how to reduce it. But, do you know, that sometimes a single page visit on your site is not treated as a bounce rate? Let’s see such scenarios when the visit doesn’t lead to a bounce rate. It is a case when a visitor lands on your web page, hits on an event which is being tracked by the event tracking code and then the visitor leaves the web page without browsing through other pages. For example: Suppose, a visitor lands on your website and clicks on the video placed there. When the ‘play’ button is clicked, then, you can track that event through a code. Therefore, Google doesn’t treat it as a single page visit. As one GIF request is made by the Google Analytics tracking code and the second GIF is made by the event tracking code (to track the record of how many times the video button is clicked). In this case, a visitor lands on your page hits on a social media event which gets tracked by the social interaction analytics tracking code and then the visitor leaves web page without browsing for more web pages. For example: Suppose, a visitor lands on your blog post, reads it and shares it via a social sharing button (which gets tracked) and then leaves the website. In this case, also, two GIFs are sent to Google Analytics during the session. Thus, remember these two scenarios while designing your website, so as to reduce the bounce rate. Implement these tactics on your website and reduce its bounce rate. Remember, if the visitors stay on your site for a longer period, then it may lead to high conversions.